Great bucking broncos, we have news! With echoes of ‘Davy, Davy Crockett, King of the wild Frontier’ ringing in your ears, you won’t need to visit Texas, Wyoming, or Arizona, just come on down to Silverton Street Market on 4th August and experience the Wild West in all its iconic glory! Plans for Children’s entertainment are well underway – make your own sheriff’s badge, get your face painted, have a glitter tattoo, jump on the bouncy castle, explore the Play Bus, join in with Dan the Hat or relax and watch the Punch and Judy show. All this while parents enjoy the Pimms and Prosecco bar or a lovely pint of this year’s celebratory brew from the Exe Valley brewery, which we’re calling ‘Silverado’. And they’ll be plenty to do for grown ups too. 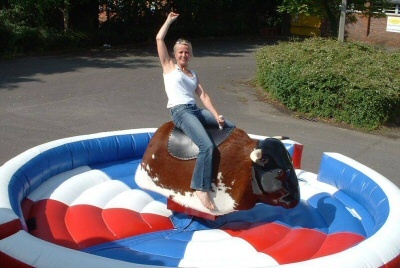 Perhaps with a bit of dutch courage on board you’ll be ready to challenge the bucking bronco … and, after a few more, challenge the bucking bronco again! They’ll be a leader board, and a prize for the most resilient cowboy or cowgirl. When you’re hungry, try out one of the chuck wagons that will be open all day. At the moment we’ll definitely be having the usual delicious burgers, but are also lining up many others including pizzas, crepes, Thai and more. Entertainment is a vital ingredient of the day, and so are the various market stalls that will line the main traffic free Silverton Streets. Everything from jewellery to antiques, homemade cakes, organic veg, perfumes and potions, handcrafted gifts and works of art. If you have an idea for a stall, perhaps with a ‘wild west’ theme, then why not make a booking at our Want a stall? webpage. The raffle will be at the usual time of 3.30pm then gather on the ‘Little Rec’ for the ever popular tug of war at 4pm. This year there’s a bar extension so join in with the Hoedown which will start immediately after the tug of war. Come on down and join in the fun!